If you came across this suspicious looking boat while on a walk, what would you do? Twenty-foot boat washed up in Crescent City, CA, in April 2013 confirmed to be debris from the Japan tsunami. This article will tell you how to report such an item, and explain how becoming an active citizen scientist could help clean up our beaches and shorelines. To date, there are confirmed reports of tsunami debris having already reached the coasts of Alaska, British Columbia, Washington and Oregon. The 20-foot boat in the above photo washed up in Crescent City, CA this past April and was confirmed to be Japan tsunami debris. If you live on the West Coast, you probably spend summer days on the beaches. It’s hard to resist the allure of tidal zones, whale, sea lion and otter watching, surfing, and just general lurking and lulling. Some are predicting that we all may find new items of interest this summer: debris swept into the Pacific Ocean during the 2011 earthquake and tsunami in Japan. If you are living on the West Coast, you should prepare yourself to take photos and send them to those who can help identify debris. Items that tend to be confirmed quickly have unique identification markings, such as characters from a town or organization. The Government of Japan estimates that 5 million tons of debris was swept into the Pacific Ocean, about 70 percent sank right away, leaving 1.5 million tons floating off the coast. This means you may find anything from bottles, jugs, Styrofoam, building fragments, boats and plastics to wood, docks, ropes, buoys and any other personal items that could have been swept away. As I wrote in a previous post, I have been in an official role looking for Japan tsunami marine debris since last August as a volunteer of the Farallones Marine Sanctuary Association’s Marine Debris Monitoring and Assessment Pilot Project. The irony is that I found the particular debris below on North Beach at Point Reyes while on another volunteer project, Beach Watch, where we monitor the health of the beach by counting live and dead birds and mammals. Through my volunteer work, I see that much of the information provided by the press to the public regarding Japan tsunami marine debris is misleading or not explained properly. The National Oceanic and Atmospheric Association (NOAA) has a web page on their site with updated information on Japan tsunami marine debris. Please pass this along to whoever can help NOAA collect information about debris. The good news is that the NOAA Marine Debris Program is an active network that addresses the issues around marine debris impacts through research, prevention and reduction. Efforts from citizens like you in communicating the location of the debris helps in the global effort to eliminate marine debris in the world’s oceans. 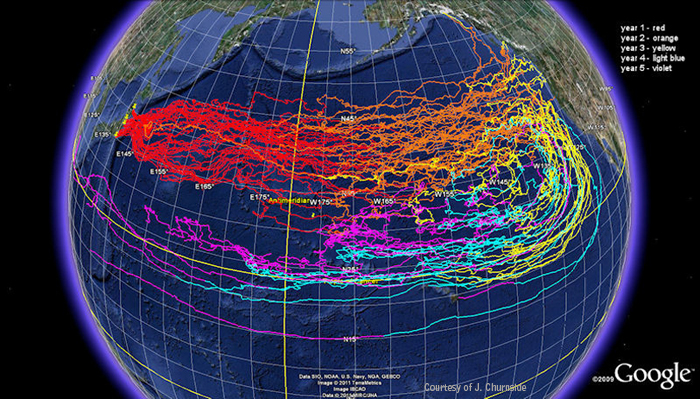 NOAA has also published a Japan Tsunami Marine Debris Model with the OSCURS Model showing the different colors predicting the movement of marine debris generated by the Japan tsunami over five years. The results are shown here. Year 1 = red; Year 2 = orange; Year 3 = yellow; Year 4 = light blue; Year 5 = violet. The OCSURS model is used to measure the movement of surface currents over time, as well as the movement of what is in or on the water. NOAA states that it is difficult to discern debris from the Japan tsunami event from other types of marine debris. They are creating and publishing updated models that show how they expect the debris to be distributed. Other models that have been created to simulate how the debris will land over a 5-year period. If you are walking on the beach this summer and find debris that looks like they may be from the Japan tsunami, you can take photos and mail them to NOAA officials at DisasterDebris@noaa.gov. If you are a big fan of using apps, you can download the Marine Debris Tracker App and upload images with your smart device. They appreciate it if you add some scale to the photograph to get a sense of size of the item and can provide information about exactly where it was found. Make sure you take a close up of any unique characters or markings that would help them identify the original location of the items. Here is an example email that I sent in along with the photographs taken by the Panasonic Lumix TSA4 camera, which records the GPS position on the photos. After sending in my photos, I received a very appreciative email from a senior scientist at NOAA, thanking me for my efforts and asking me to spread the word about how the rest of you can help. So if you’re feeling that you need a project this summer, keep your eyes open for debris. Help this the national and international effort to identify, reduce, and prevent debris in the marine environment. In reporting this debris, you will also feel empowered because you are improving the health of our oceans and beaches.